Bad breakup? Overwhelmed at work? Having a crummy week? Stress and rough patches are inevitable no matter who we are. Perhaps things have moved beyond stress, and you’re dealing with anger from divorce, loss of employment, or another trying situation. What do you do when you need to breathe? Would throwing a bottle against a wall or taking a bat to a television help? Maybe the thought crossed your mind but you thought the better of it. What if I told you that there’s a place where you could destroy things for fun? Fury Room in Chicago’s Lincoln Square Neighborhood invites people to decompress by breaking things. Individuals are seeking new ways to escape from day-to-day pressures. As a result, anger rooms are gaining popularity and appearing in cities all over the world. Chicago’s newest additions to the scene are the Fury Room in Lincoln Square and Escapades-Rage Room in River North. Of course, a strenuous workout may do the trick for some. But others may need a release on a grander scale. Plus, let’s be honest, it’s more fun to break things. You can even scream while doing it! 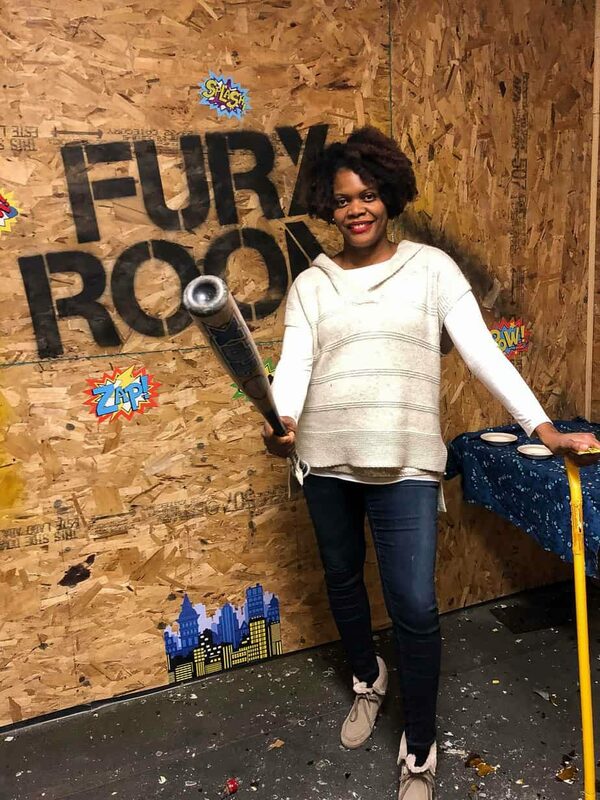 The owners of Chicago’s Fury room and Chicago Rage Room-Escapades want visitors to de-stress and release anger and frustration while destroying things in a safe environment without judgment. Although the name denotes angry emotions, you don’t need to be incensed to take advantage of it. It’s a great release for everyday stress and quite a workout. After I smashed a table and television, I experienced a certain calmness. It was therapeutic. Giving it a try is simple. Both places operate pretty much the same. First, you gear up. The protective gear covers you from head to toe. Although, it’s a chore getting dressed you’ll appreciate the safety measures once you see glass flying at you. Knowing you’re fully protected gives you the confidence to let loose and go crazy. I utilized a sledgehammer and baseball bat. Select your package based upon the type and amount of items you’d like to break. Fury Room has three themed rooms to choose from with two rooms accommodating up to four people. I’m sure the favorite will most likely be the space that resembles a living room. Several people who watched my Instagram stories from my media sneak peek mentioned that they’ve always dreamed of trashing an apartment. Escapades offers one Rage Room plus escape rooms. Get your adrenaline pumping by having your favorite tunes blaring during your tantrum. You can either bring your own music or select something while there. I admit, I initially felt a bit awkward smashing things. I mean purposely damaging things is taboo. Plus there’s jail if you do it in public, lol. I felt as if I was misbehaving, but after I loosened up and got into, I had a blast! It’s fun destroying things without consequence. The Fury Room is located in Chicago’s Lincoln Square neighborhood, and Chicago Rage Room Escapades can be found downtown in Chicago’s River North neighborhood. Give them a visit when there’s the need to blow off some steam! Remember to capture all the glory on video! Click here for other fun things to do in the Midwest!